One night at dinner, some friends and I focused our conversation on a small bronze snail figurine placed between the salt and pepper shakers and the butter jar. One friend picked it up, noting its heft and pointy feelers. Another friend commented on its hidden abilities to bring an intruder to their knees if used correctly. “We should have a guard snail sign, and we should name him after Emil!” exclaimed another table member, referring to the most amicable of us in the group. DONE and DONE. You don’t have to tell me twice to make a Guard Snail sign. At the slightest urging I’ll scuttle off and make a whole series of the most terrifying and life-threatening guard creatures ever! Post the Guard Squirrel on your front door and acorn thiefs will hightail it lickity split. Place the Guard Goldfish on your water closet door and no guest will ever dare leave the room smelling of other than dewdrops and roses. Put the Guard Kitten in your wallet amongst your family photos and pickpockets will walk your pilfered money sleeve to the nearest precinct. GUARANTEED. All of these Guard Animals are available for download and personal printing in the following PDF files. 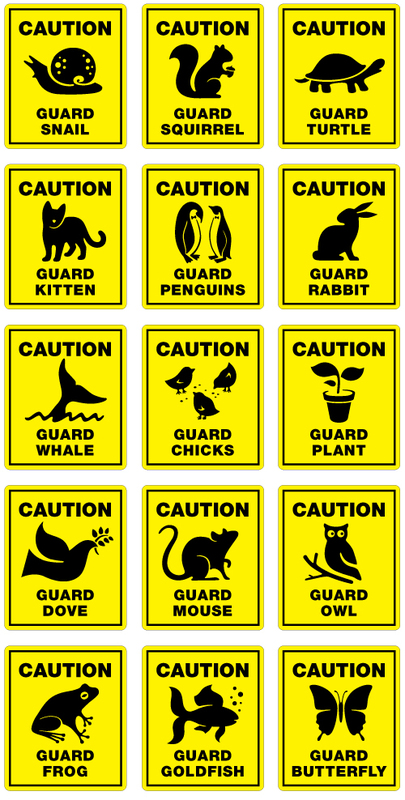 Each PDF contains all Guard Animals, so find your selected weapon, print the appropriate page and cut out your sign. The signs are smallish, the the impact is large. 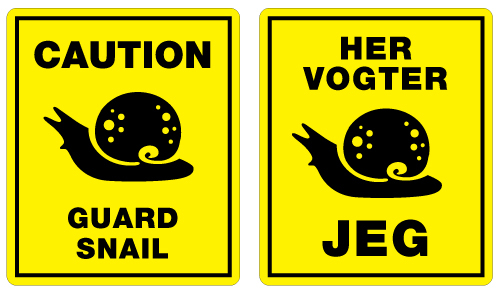 The classic English caution sign and the original “her vogter jeg” sign inspired by the small but lethal bronze table ornament “Emil the vagt snegl”.